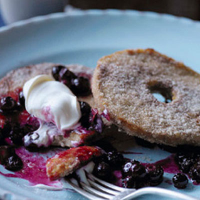 These amazingly moreish French toast doughnuts are quick and easy to make, but can you eat one without licking your lips? Cut the bagels in half horizontally. Lightly whisk the eggs and the milk in a large, shallow dish (a rectangular baking dish works well). Add the bagels and leave them to soak for 5 minutes, turning them occasionally, until thoroughly sodden and all the egg mixture has been absorbed. Meanwhile, place the blueberries in a pan with 1 tbsp cold water and 2 tsp of the sugar. Bring to the boil, then reduce the temperature and simmer for 5 minutes, until reduced and syrupy. Warm a non-stick frying pan over a high heat and add the butter and oil. When the butter has melted, add the soaked bagel halves, 2 at a time, and cook for 1-2 minutes on each side or until golden, reducing the heat if the butter starts to burn. Place the remaining cinnamon sugar on a large plate. As soon as the doughnuts are cooked, drop them into the sugar and turn to coat evenly. Eat warm with the blueberry sauce spooned over, or serve with vanilla ice cream or crème fraîche as a pudding.